It may only be the first Saturday of October, but it’s already the fifth weekend of FA Cup action this season (including the extra preliminary and preliminary round). Having managed to attend a match at a different ground in Sussex in each of the previous four rounds, it has become my intention to keep this run going for as long as possible (not including Crawley and Brighton when the league clubs enter the competition in November and January respectively). With Eastbourne Borough and Horsham being the only Sussex representatives drawn at home in the Third Qualifying Round, my decision became a straight toss-up between the two. Ultimately, I plumped for Borough, simply due to time constraints this Saturday making a jaunt eastward along the coast slightly easier for me. This meant for the first time this season I would be visiting a ground belonging to a team in the heady heights of the National League South. 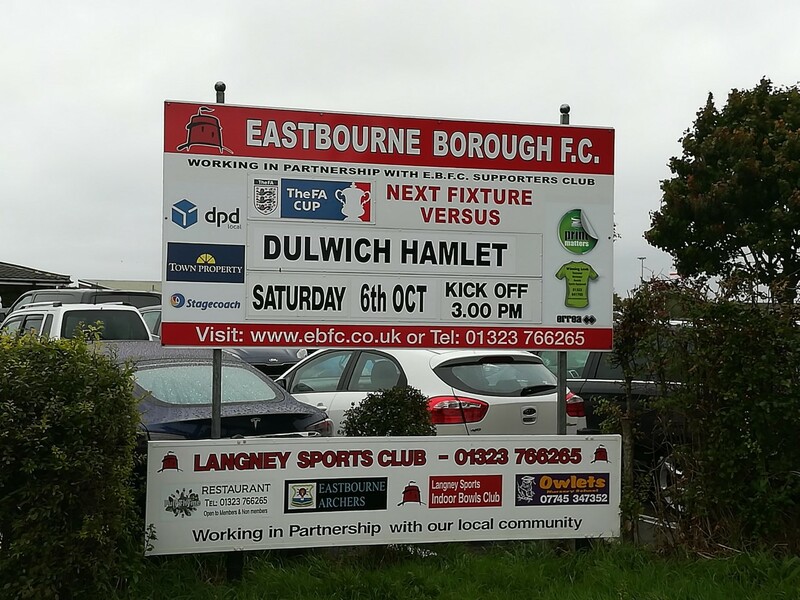 What’s more, Borough’s opponents were league rivals Dulwich Hamlet. Two National League South teams! I know, I’ve gone big time! Now, in the interests of honesty, I have visited Borough’s Priory Lane ground on a handful of occasions previously. 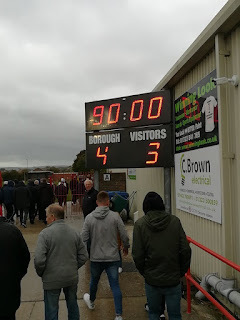 The first time I went there was around 20 years ago, when Borough were still known as Langley Sports, while my recent visit occurred roughly 15 years ago, when The Sports (as the current incarnation of the club are also known) were plying their trade in the Southern League. 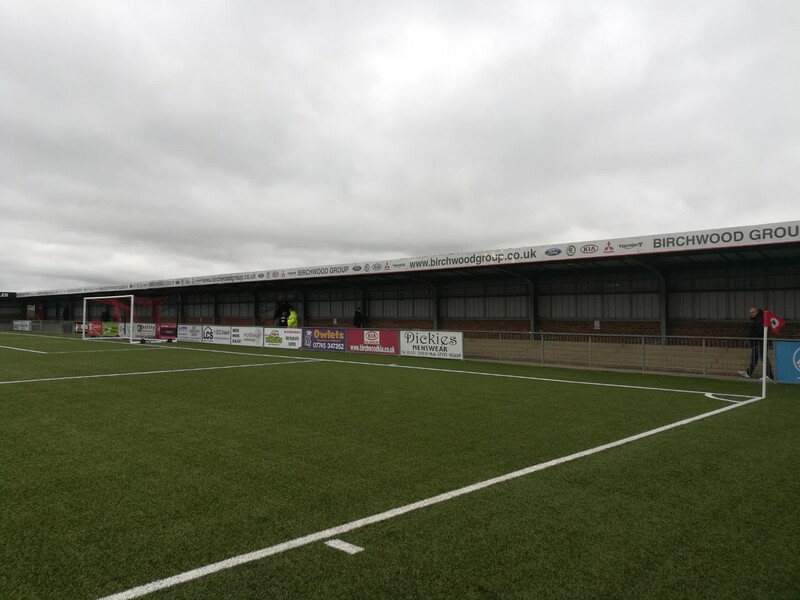 It’s fair to say that the place has changed drastically over the years, reflecting Borough’s standing as Sussex’s highest-ranked non-league club. A position it’s held for a few years now. With covered areas along each side of the pitch, including a decent-sized main seated stand, there’s thankfully plenty of space to shelter from the swirling wind and rain which hit Sussex in the early afternoon. The clubhouse is certainly much bigger than I remember it being, and there are a number of snack bars handily located around the ground for those who choose not to brave the queues at the bar. There’s also a nifty electronic scoreboard of which my five-year-old son would have been most impressed. The main change since my previous visit, though, is arguably the playing surface, with a top-of-the-range 3G pitch now taking pride of place. 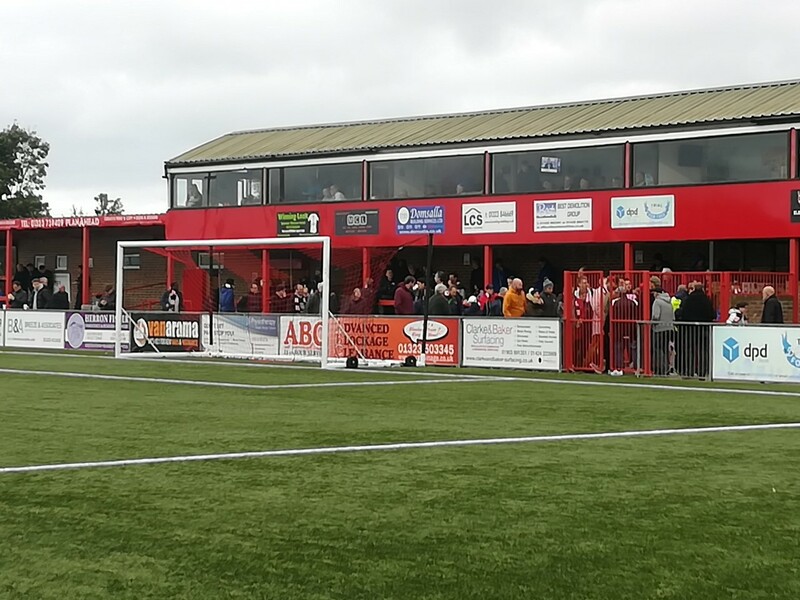 The entrance fee (£13) is the joint most I’ve paid to get into a ground this season – although as it’s also home to the highest-ranked side I’ve seen this is no real surprise. 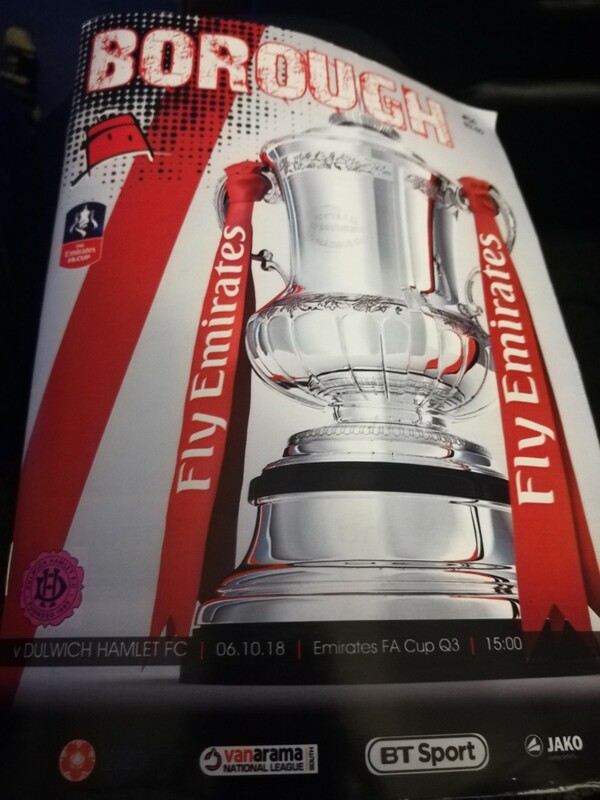 The program (£2.50) is yet another fantastic example of the great value for money that some of these publications offer nonleague match-day fans. Forty-eight pages, full colour and packed full of information, it’s another great effort. Having literally arrived at Priory Lane right on kick-off time, due to some heavier than expected traffic in and around Eastbourne, and then a lack of parking spaces in the surrounding roads, I’ve barely taken my place on the terraces (under cover, of course) before the home-side take the lead through a first-time strike from Alfie Rutherford. Another couple of chances for the hosts go abegging, and there’s even time for a disallowed Sergio Torres effort, before The Sports double their lead with just a quarter of an hour played. It’s the goal of the game, too, as Ryan Hall blasts an unstoppable, swerving strike past the helpless Hamlet keeper from around 25 yards. By this point, the Hamlet fans, of which there were surprisingly many, could already be heard to be muttering about fearing the worst. I don’t have any official data for this, and I certainly haven’t been counting (I’m not that sad… yet), but I would say Dulwich brought a greater number of visiting fans than any other away side I’ve seen this season. That being said, I did read somewhere (it may have been in Nige Tassell’s brilliant book The Bottom Corner: A Season with the Dreamers of Non-League Football) that Dulwich’s distinctive navy and pink stripped scarf has become something of a fashion statement in the trendier circles. So maybe Eastbourne is just home to far more hipsters than I’ve ever given it credit for. Either way, their fears were quickly realised when Borough were awarded a penalty on the half-hour mark. 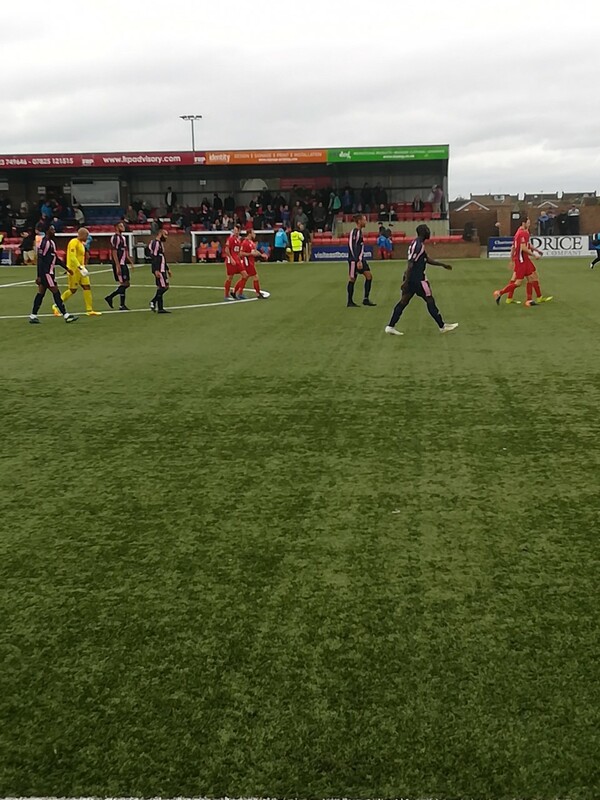 At first, the home side may have been worried that the ref had blown for the decision slightly early, as Eastbourne actually had the ball in the net seconds after the whistle had blown. Yet Dean Cox ensured no damage was done, confidently sending the keeper the wrong way from 12 yards (see video). There’s an old saying that things will get worse before they get better. This was certainly true for the visitors as they found themselves down to ten men after 40 minutes. I’ll be generous and say that a wild two-footed tackle on Cox by Iffy Allen was simply mistimed rather than a deliberate attempt to get himself out of the nightmare match he and his teammates were enduring, but either way a more stonewall red card you will rarely see. Although bafflingly I did hear a couple of Hamlet fans moaning about the decision – tribal loyalties blind us all at times, I suppose. A thoroughly miserable half for Hamlet was then completed minutes later, when Hall made space for himself in the area and calmly finished past the hapless visiting keeper for his second of the game. At half-time, the Dulwich manager was no doubt just urging his players to avoid a complete and utter spanking, while the Borough manager was almost certainly asking for more of the same. Personally, I was worried that I would find anything particularly positive to say about Dulwich, aside from the fact their kit is brilliant. We definitely need more pink and navy combinations in the game! 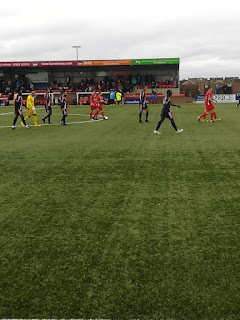 However, with the fans of +both teams almost certain the game was already over (one Dulwich fan quipped during the interval that only rain could save them now – damn that 3G surface!) it seemed the Borough players believed it too. There was a distinct lack of urgency from Eastbourne’s players in the second-half, with all of them playing at half the level they were in the first half, evidently thinking they’d already done enough. In fairness, they were comfortable for most of the second half, with Dulwich hardly busting a gut themselves to get back in it. Even when Dipo Akinyemi pulled one back with little over ten minutes remaining, even the most optimistic visiting fan can surely have viewed it as little more than a consolation. That tiny seed of belief started to grow just four minutes later, when Nyren Clunis raced clear of the defence and finished confidently to reduce the deficit to two. 4-2, and now the Hamlet fans were in full voice for the first time in the afternoon, while Borough fans were far more nervous than they had ever expected to be. Much to practically everyone’s disbelief that nervousness turned to full-blown anxiety just a minute later. Almost a carbon copy of the second goal, only with Kingsley Eshun running through to finish on this occasion. The home players looked utterly shellshocked. The home supporters looked utterly s**t scared. Fortunately for Eastbourne, and unfortunately for Dulwich, there was to be no dramatic equaliser, and after three nervous minutes of stoppage time Borough progressed to the fourth and final qualifying round. Albeit far more uncomfortably than they could ever have imagined being the case 45 minutes earlier. As to my FA Cup progression, well that’s a different story. 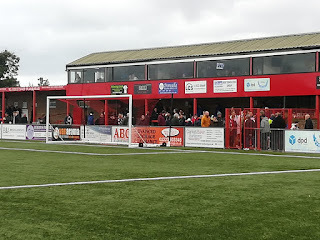 At the time of writing, only Eastbourne and Worthing are definitely through to the next round (and if you’ve been paying attention to this blog you’ll realise that I’ve been to both grounds already this season). Lewes, Whitehawk (staggeringly so) and Hastings all crashed out in the third round, while Horsham have a replay and Lancing (who earnt an FA Cup reprieve a couple of weeks ago) are a round behind. My fingers are tightly crossed that my Sussex FA Cup run doesn’t end here, but if it does, then in the immortal words of Vinnie Jones at the end of Lock Stock and Two Smoking Barrels, it’s been emotional.